The Japanese word Aikido consists of three characters which can be translated as "the way of unity with the fundamental force of the universe". 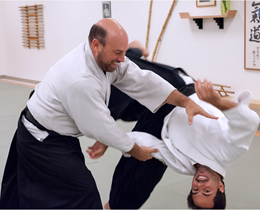 Aikido is a true Budo or "Martial Way." It has evolved in the historic tradition of Japanese warrior arts. 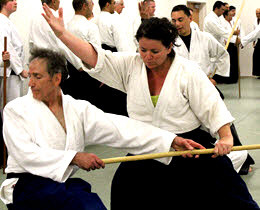 It must be understood that studies in earnest Budo is more than a science of tactics and self-defense; it is a discipline for perfecting the spirit. Aikido was developed by Morihei Ueshiba, known to thousands of students of Aikido throughout the world as O-Sensei (Great Teacher). Even as a young man, Morihei Ueshiba was an extraordinary martial artist; a master of the sword, the staff, the spear, as well as the art of ju-jitsu. But O-Sensei also had a strong spiritual drive, and brooded over the futility of a path based on victory over others. 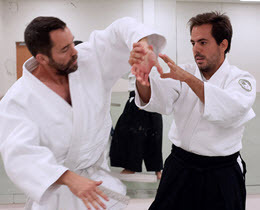 "The secret of Aikido," he wrote, "is to harmonize with the movement of the universe and bring ourselves into accord with the universe itself". O-Sensei maintained that Budo is a work of love, a path to overcome discord in ourselves and bring peace to the world, "To make the heart of the universe one's own heart." O-Sensei taught that true awareness is not grasped by intellect alone. "This is not mere theory," he said. "You must practice it."